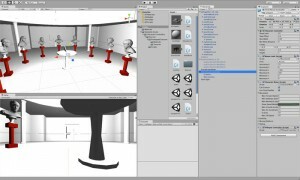 Virtual Environments research is committed in promoting a wide range of activities, from uncovering hidden traces of the past to promoting the role of heritage in the future cities. It features state-of-the-art equipment, like 3D stereoscopic projectors; Oculus Rift stereoscopic goggles & Virtuix Omni treadmill. 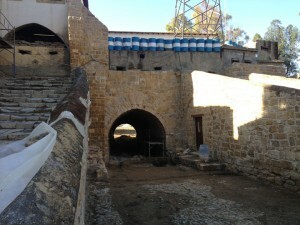 The aim of our research is the development of real-time 3dimensional virtual environments to test the potential of spatially distributed narrative structures in engaging users in the operation of cultural heritage monuments in the urban environment of the historic center of Nicosia to inform the public and evaluate the design and historic development of cities, buildings and exhibition artifacts. These interactive environments perform as a meeting place for play, communication, collaboration, exploration, discovery and therefore learning and education. “RIVEEL 3D” (Realtime Immersive 3D Virtual Environments for Education and Learning) is part of the Cyprus Institute’s new cultural heritage research initiative. 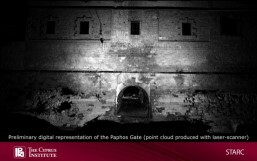 Georgios Artopoulos is leading the effort to scan and analyze virtual environments that represent real historical sites, starting with the Paphos Gate. The Paphos Gate has undergone many renovations since it was first built into the wall of a pre-Medieval city’s armaments, but it has always represented a border, even now where it sits directly adjacent to the UN border zone dividing Greek Cyprus and Turkish Cyprus. The tool the AVL is building will allow artistic researchers to create historical environments, members of the public to explore these environments, and cultural researchers to analyze and teach in the environments. Because the historical sites in Cyprus frequently represent many time periods and cultures building on top of one another, the software will allow the users to show different versions of the same sites in completely dynamic scenes. Copyright © 2017- Cyprus Institute. All Rights Reserved.